If I were to tell you that you had an opportunity to explore an open world with a variety of seasons and settings as an animal, would you be interested? I was, which is why I took the opportunity to explore the game Meadow, a sandbox style MMO game that puts players in the shoes (paws?) 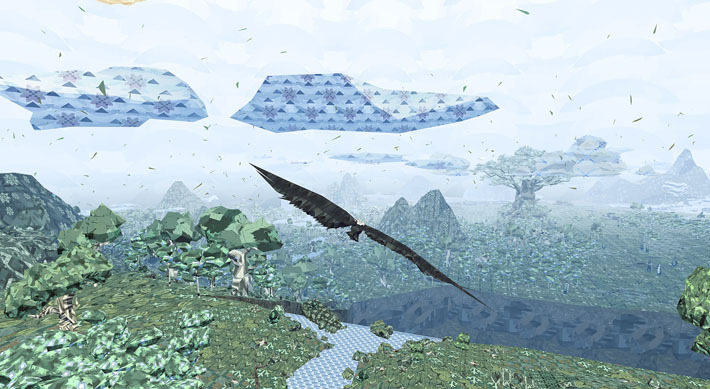 of various types of animals in an open world setting. 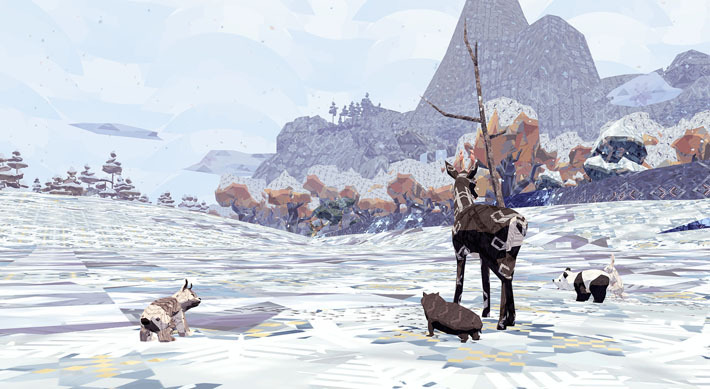 I haven’t played any of the prior games created by Might and Delight, such as Shelter or Shelter 2, but I was familiar with the concept of playing as an animal in the world they have created. I am also familiar with the way that those games play; which is heavily focused on caring for members of your family and ensuring that they avoid predators or natural disaster, while also staying fat and happy on a steady diet of other animals. It is this gameplay equation that has ensured the success of the developer, and there are few games similar to the formula they perfected. Might and Delight took the artistic style that they were known for and opened it up into a bit more of a diverse landscape, one that offers different seasons based on where you are on the map, and interesting landscape quirks that make exploring fun. They also coupled this with a soundtrack that ensures a calming and atmospheric attitude that permeates through you into whatever animal you are exploring as onscreen. It is as an explorer that you are expected to unlock additional emotes used to communicate with other users, skin variations for the animal that you are playing as, and potentially other animals altogether. The strange thing is that any of the aforementioned gameplay elements that previous titles are known for have been removed. There are no wolves in the wild that need to be avoided. There is no natural disaster that must be averted to ensure survival. There are puzzles still, but that seems to be it. This is unfortunate, as I had hoped for a survival or simulation type of game. I had fantasies in my head while the game loaded of finding a suitable location in the world to build a nest and foraging for plants and animals that could satiate my animalistic appetite. I knew it wouldn’t necessarily be some complex or brutal system that allowed these things to happen at a high level, but I had some hopes. The goal of Meadow, it seems, is not to provide a compelling story or a connection to your character, but instead to allow interaction on a base level with other players in the online world. I say base level because the game limits interactions solely to the audible barking or mewing that you trigger with a left-click, or any of the emotes you have been fortunate enough to piece together -- literally. It is a self-described “forum in games clothing,” but also not a forum at all, because there is no ability to share any actual conversation. After the initial enjoyment of being a baby badger running around frogs, deers, lynx, and other animals, the flaws overtook the ambient. For instance, the game stuttered when in a group of animals (a shame given the focus). There were tearing issues and textures were limited, so the world looked the same, often. Couple this with the tedious nature of finding puzzle pieces to unlock animals, skins, or emotes, and no tutorial or explanation of what any of the game elements are and you have a recipe for disaster. Finally, unless you own previous Might and Delight titles, you start out as a baby badger, and you stay that way until a new animal is unlocked. This is a shame, as there may have been even a slight uptick in playability if I was looking at the backside of a lynx or flying through the air as an eagle. Instead of staring at a badger's behind for hours on end. I spent 7 hours in the world created by Might and Delight. In those 7 hours I unlocked 5 emotes, 0 skins, and 0 animals, and made 0 meaningful connections with the 30+ other animals I met... But it was pretty, I guess. I wanted to like Meadow, mostly because it sounded unique, interesting, and potentially captivating. It isn’t though, at least not for me.